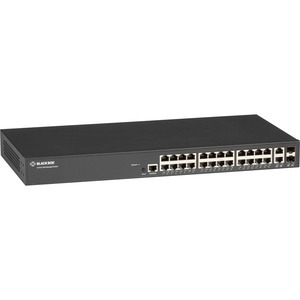 This capable Layer 2+ switch offers 24 autosensing 100-/1000-Mbps RJ-45 Ethernet ports, plus 2 dual-media ports, each of which consists of one 100-/1000-Mbps RJ-45 port plus a 100-/1000-Mbps SFP port. The dual-media ports can be used either as a normal UTP Ethernet port for copper connections or adapted to fiber through the use of an SFP. You can also bundle multiple ports to create a single high-bandwidth port using 802.3ad LACP aggregation. The switch supports 4 ports per group and up to 13 groups total. Combine Gigabit ports, for instance, to create a multilink trunk for load sharing. It's especially beneficial in switch-to-switch cascading applications where you require higher full-duplex speeds. The switch supports 1024 multicast groups. Broadcast/multicast/ unicast storm control enables you to restrict excess traffic on your network. Plus, it has IGMP (v1/v2/v3) for limiting bandwidth-heavy multicast traffic. The switch is fully managed, supporting SNMP version 1, 2c, and 3. The embedded RMON software agents support RMON groups 1 (history), 2 (statistics), 3 (alarms), and 9 (events). It also includes a DHCP server to assign IP to DHCP clients. The integral Web server enables Web-based management via Web browser. This GUI interface enables switch configuration, system dashboard, maintenance, and monitoring. In addition, a Device Management System provides topology and map view graphical monitoring, traffic monitoring, and troubleshooting. The wide range of management and support features also includes dual image, port mirroring, LLDP, sFlow®, UPnP®, IPv6, SSH, RADIUS, DHCP Client/DHCPv6 Client, SNTP, cable diagnostics, ping, syslog, and Telnet client with SSH security. The switch supports up to 4000 simultaneous VLANs for isolating guest traffic from your critical corporate network traffic. You can segment traffic with port-based, 802.1Q tag-based, or MAC-based VLANs. Plus, you can also program higher-layer classification and prioritization for reliable Quality of Service (QoS).802.1p Layer 2 QoS enables prioritization of time-sensitive applications, such as VoIP and video. You get enterprise-class security features, too. In addition to the switch's VLAN support, it boasts 802.1X port-based network access control for authenticating devices connecting to your network. In addition, the switch supports SNMPv3 cryptographic security, SSH, and SSL for remote management via a connection that encrypts the packet content at each session. Plus, you can set up a guest VLAN that enables visitors to access the Internet without also giving them access to the corporate network. By using its extensive ACLs (up to 256 entries total), you can keep guests or unauthorized users from accessing sensitive portions of your network. The Gigabit Ethernet Managed Switch features IEEE 802.3az Energy-Efficient Ethernet, which scales down power consumption during periods of low data activity. This feature adds up to energy savings of up to 50%.